GrillBot Reviews - Is it a Scam or Legit? If you’re tired of cleaning your grill after cooking, GrillBot claims to be the world’s first automatic grill cleaning robot that takes the “grunt work” out of cleaning your grill, and can work in as little as 10 minutes. The company even claims that GrillBots were designed to simply your life, while still maintaining flavor. But how much easier do GrillBots really make the grill cleaning process, and is it worth the price? Let’s apply a little heat to the facts and see what we can cook up. Place the GrillBot on your grill and choose your run time (10, 20, or 30 minutes) by pressing the button located on the side. Although GrillBots are claimed to be safe for use up to 250 degrees, your grill should be turned off, and there should be no open flames. There will be a 5-second delay, which gives you time to close your grill’s lid. The GrillBot automatically cleans your grill using a CPU chip and 3 high power electric motors that controls brush speed, movement, and direction. The LCD alarm will alert you when cleaning is complete. GrillBot’s replaceable brushes are claimed to last about 100 cleanings, to easily pop off, and to be dishwasher safe. The company claims that brass brushes are intended to retain flavor while effectively cleaning your grill, while the stainless steel brushes are intended for more thorough cleaning. However, the stainless steel brushes are intended only for non-treated (e.g. cast iron or expanded steel) grilling surfaces. The company’s website claims that GrillBots are available in two models: Base and Premium. We learned that the Base model required 6 D batteries to operate, while the Premium version includes a rechargeable battery with an AC adapter. However, we were only able to locate one GrillBot version, whether directly on the company’s website or elsewhere online. GrillBots are available in 4 colors (black, blue, orange, and red), and are priced at $129.95 each. A set of three brass brush replacements is priced at $12.95, and a set of three stainless steel brush replacements is priced at $14.95. A carrying case will be available soon, although no price is listed. According to the product’s website, GrillBots are currently only available for preorder, although they claim the expected delivery date is May 7, 2014, which has already passed. However, we did also find GrillBots being sold through Amazon.com, which were claimed to ship within 6-10 days of order placement. If purchased directly through the manufacturer, GrillBots come with a 30-day return policy, and must be unused and include original packaging and all accessories. GrillBots also include a 6-month warranty against defects in materials and workmanship, although you can purchase an extended 1-year warranty for an additional $19.95, and an extended 3-year warranty for an additional $26.95 directly through the company. What Do Other Consumers Have to Say About the GrillBot? 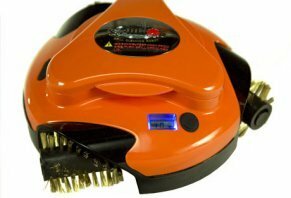 GrillBot was invented by Ethan Woods, who claims he came up with the idea after attaching a wire brush to a drill to clean his grill. Currently, the company is based out of Chino, CA, and is not listed with the Better Business Bureau. Despite being under development for several years, the company recently launched in January 2014, so online customer reviews were limited at the time of our research. With this said, these reviews appeared to be mixed, with the most common complaints citing that it does not cover the entire grill surface, that it is very loud (bangs on the cover), and that it comes with a very high price (we’ll explore this further in the following section). What’s the Bottom Line About the GrillBot? Most importantly, GrillBots come with a fairly high price tag, and seem to offer minimal value for this amount of money. This is because they appear to clean the top of your grill fairly well, but don’t clean in between the grates. In fact, several third-party websites who tested the GrillBot claimed that they were still required to clean in between grates using a standard grill brush, even after using the device for as long as 20 minutes. Second, the company heavily promotes the fact that GrillBots can allow you to spend more time with your guests instead of cleaning your grill. However, another big complaint is that the device is extraordinarily loud as it bangs around in your grill, which could be distracting to any conversations you’re trying to hold. Next, it doesn’t appear that the GrillBots website has been updated in a while, as the company claims their products are on pre-order, although we found them actively for sale on Amazon.com. On top of this, GrillBots are claimed to be available in Base and Premium models, although there appears to only be one model available, whether directly through the company or through a third-party vendor. Bottom line: Most grill surfaces are relatively small, and can typically be cleaned with a traditional grill brush in less than five minutes. This means that, even if the GrillBot worked as well as it claimed, it ultimately wouldn’t save you a lot of time. With this in mind, based on several professional reviews, it appears that the GrillBot effectively cleans the top of your grill, but does not adequately clean in between the grates. Ultimately, this means you’ll be spending a lot of money for something that’s very loud and that doesn’t fully clean. Received the Grillbot Automatic Grill Cleaning Robot as a birthday present. Unit does not work at all when it comes to cleaning the grill grates. After running for two 20-minute cycles on a grill that I keep relatively clean after every use, there was zero visible difference. Advertised as "provides deep, hands-free grill cleaning." Definitely not worth the cost, buy a hand brush for much less. Contacted bbqguys.com (retailer) and was informed that their "90 Day No Hassle Returns" was only applicable to "new, unused, unassembled, and resalable items," same as the manufactures warranty. Not sure how you would know if this item works, or anything else they sell, as advertised if you cannot use it to try it. Misleading advertising, poor value! Write a Review for GrillBot!